"Merzhanov emerges as a pianistic force to be reckoned with....For pianophiles, this is a 'must'." "Viktor Merzhanov's playing is sometimes massive, sometimes poetic, sometimes mysterious, and always musical - never are the power and brilliance in the foreground." ”This title continues the Goldenweiser School, the last of the three great teaching traditions to be covered in this comprehensive survey of the many great pianists who worked in Russia in the Soviet era. The bulk of the issues in THE RUSSIAN PIANO TRADITION will be divided into 'schools' which represent the three main teachers of this period - Neuhaus, Goldenweiser and Igumnov, - and their pupils. 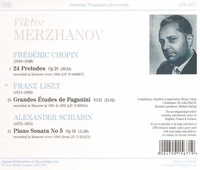 One of the youngest pianists to be featured in this series, Victor Merzhanov is more a grand-pupil of Goldenweiser than a pupil, as his major professor was Samuil Feinberg. It seems certain though, that while studying with one of Goldenweiser's most illustrious pupils he would also have had contact with the great man. Merzhanov graduated from the Moscow conservatory in 1942 and, after war service, shared first prize in the 1945 All-Union piano competition with Sviatoslav Richter. He began teaching at the Moscow Conservatoire in 1947 and, at the age of 90, continues to teach and serve on competition juries today.